Cloverbuds are 4-H youth members in grades kindergarten through second grade. 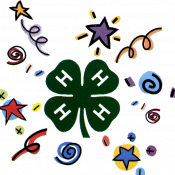 Cloverbuds participate in club meetings and projects along with older 4-H members in their club. What types of things can Cloverbuds do? Cloverbuds explore a wide variety of topics in order for them to find their areas of interest. A few areas crafts, science and nature, gardening, food, and music. Cloverbuds have the opportunity to attend 2017 Cloverbud Day Camp, generally held in July. At this day camp, Cloverbuds will get the chance to do a few projects and activities that they can enter into the fair if they wish, and they will get the chance to meet other Cloverbuds from around the county. Cloverbuds can complete the Cloverbud projects to take to the Taylor County Fair. For a list of projects please see the Cloverbud Activity Book A (.pdf), Cloverbud Activity Book B (.pdf), Cloverbud Activity Book C (.pdf). Cloverbuds can meet together to explore and make projects together.